Iran's Interior Minister says "dirty money from drug trafficking" in Iran now amounts to 10 trillion toumans a year, some of which has been finding its way into "elections and the securing of votes" to influence the country's politics. Abdolreza Rahmani Fazli said in a live interview on Iran's Channel 2 that the Supreme Council against Money Laundering has approved a directive to monitor bank accounts that have suspicious activities above a certain volume in order to combat corruption and track down tainted drug-trafficking profits." 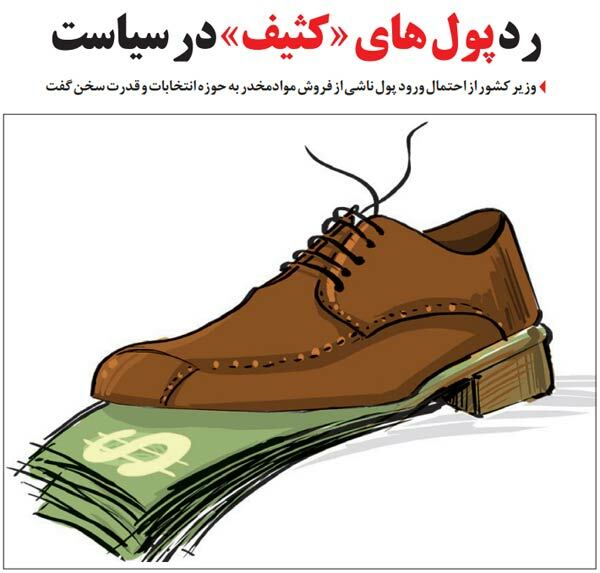 In recent years, the source of election campaign funds has become a point of controversy, even though Iranian law says that presidential and parliamentary candidates are not required to publicize the source of their campaign funds. Earlier this month, vice president Mohammadreza Rahimi was sentenced to five years in jail for financial corruption. Rahimi told the court that he had made payments to 170 parliamentary campaigns in the past elections. The interior minister also pointed to Iran being geographically positioned as a transit stop for drug traffickers, adding that the administration is implementing a project to further secure the borders with a 17-fold increase in the budget approved for border security and patrol, building walls, digging canals and installing barbed wire. He added that the project will be completed in the coming year.